THE 2007 HONDA RECON 250 for Sale IS a good looking RED, 2WD 2007 Honda FourTrax Recon ES with electric shift. PERFECT 4 WHEELER FOR HUNTING OR RECREATION. If you have any questions regarding the Recon or if you would like to make an appointment to see it in person you can get in touch with me using the phone number that I have posted below and when you call please don't forget to mention that you found my classified on GoGoCycles Used Motorcycles for Sale . GoGoCycles encourages our visitors to write a review of the used Honda for sale or share any thoughts and/or opinions to make potential buyers aware of any problems that are commonly associated with this brand or to highlight its positive features and help our visitors make informed decisions. 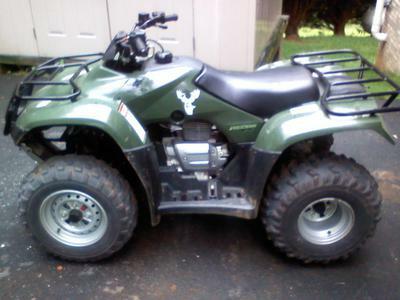 The 2007 HONDA RECON 250 for Sale is in Corning near Jonesboro AR! Price $2250 (6680). This is a very good price for a quad like this and it won't be around and don't forget to mention that you found this ad on GoGoCycles Motorcycle Classifieds www.gogocycles.com using the comments forms located on this page.